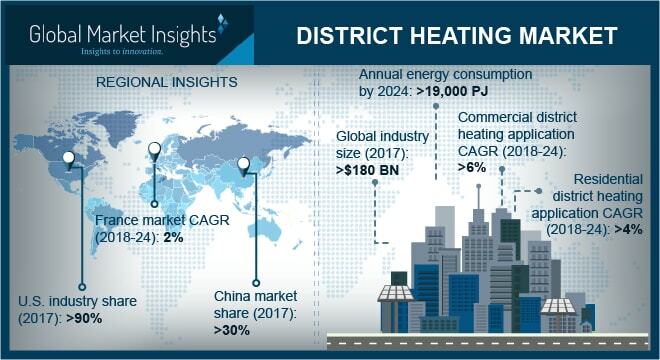 District Heating Market size will surpass USD 250 Billion by 2024, as reported in the latest study by Global Market Insights, Inc. Rigorous implementation of government regulations & policies toward the reduction of carbon emissions accompanied by growing measures toward the recycle & reuse of waste energies will drive the market growth. For instance, the U.S. Environmental Protection Agency through its Clean Air Act regulates the release of harmful air pollutants including the CO2, SO2 and NOx emissions. As per the EU, the Combined Heat and Power (CHP) based district heating system emits relatively 60% lower amount of CO2 as opposed to conventional boiler-based space heating system running on the same fuel. Solar District Heating (SDH) market is predicted to grow over 8% by 2024. Relatively lower operational cost, ease of installation, environmental performance, and economic viability are some of the key features that will accelerate the technology adoption. The EU, as part of its SDHtake-off plan aims at promoting and deploying SDH systems across Germany, Denmark, Austria, Czech Republic and Italy. Under this program, a capacity of over 500 MWth of SDH has been added and the government further aims at adding over 8 GWth by 2020. Russian market will witness substantial growth on account of stringent government regulations and standards toward the reduction of carbon emissions and adoption of sustainable & green technologies. For instance, the country has pledged to reduce the greenhouse gas emissions by 75% by 2020 from the 1990 levels. Growing renovation & modernization practices for extant conventional heating systems, aimed at energy efficiency will further fuel the industry growth. Commercial district heating market is anticipated to expand over 6% by 2024. Growing initiatives toward energy security along with rising demand for sustainable heating technologies will propel the industry growth. The ability of DH systems to offer enhanced reliability, economic feasibility and operational performance across commercial establishments will favor their deployment across the industry landscape. Rapid technological advancements, most notably the development of pre-insulated piping solutions will further facilitate the industry expansion. China, in 2017 accounted for over 30% of the global market in terms of installed capacity. Strengthening government efforts to mitigate air pollution and promote sustainable heating solutions across end-users will propel the industry growth. The ministry of Housing and Urban-Rural Development has planned to enhance the capacity of indoor heating zone across the Southern China’s upper belt, where the temperature in winters falls below 50 C. In addition, the World Bank has approved a loan of USD 100 million in 2016 for the Hebai province of China toward the establishment of green heating installations. Notable industry participants across the global market include Fortum, Goteborg, Vattenfall, STEA, Statkraft, Shinryo, RWE, Ramboll, Ørsted, NRG, LOGSTOR, Korea District Heating Corporation, Keppel, Kelag and Hafslund.